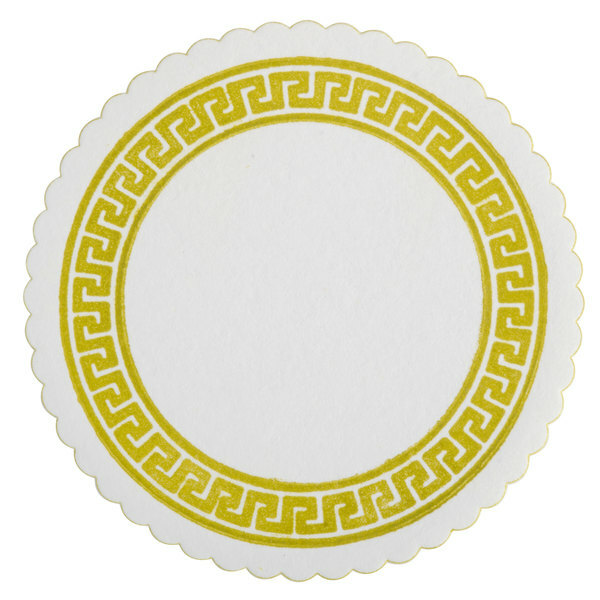 This Royal Paper RBC171 Greek key budget coaster's circular design screams 'place your glass here.' This disposable coaster's scalloped edge and gold key design provides versatility as well as style. Each paper coaster adds a simple, sophisticated touch to your restaurant or a Zen-like feeling in your coffeehouse. Depending on your restaurant's decor, this coaster could appear modern or vintage. 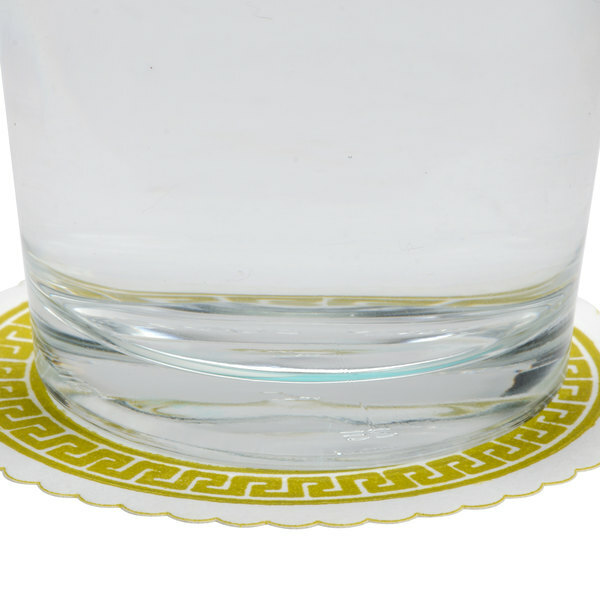 Use these disposable coasters as a barrier between beverages and tabletops to prevent potential water marks on furniture. These are cute. They can be used for any occation. I like the design it is simple but looks nice. I just wish it came in different colors. 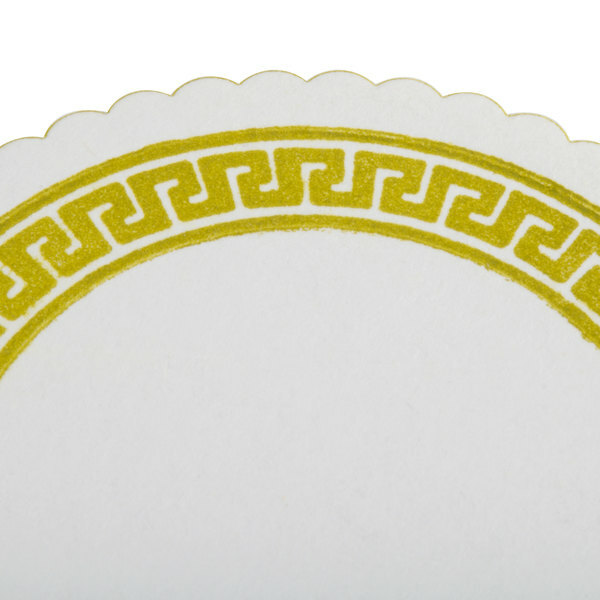 A nice Greek key design coaster that is a great price and a really good quality. A perfect coaster to be used by bars or restaurants. What a nice design. I originally had a Greek catering event and got these for the theme. However I still find myself using them long after. Super nice designed coasters. Quality thickness, texture and design. Super cheap. As always, ships to us immediately. Nice little addition to any place setting. Thank you! these greek key design coasters are a great looking and super strong product. a great value for the price. and the color is even brighter than shown here. I just purchased these for use at the bar in my base and must say, I'm impressed! This is really a great proud, much better than what I was expecting for the price. In seeing this site again, I would say their colors are brighter than they seem in the picture. These are nice coasters for a Greek driven restaurant! Nice for themed events with a bar! Good sturdy coasters protect valuable counters from being damaged from water marks!!! These would be great for a college bar! There are many college bars in my city and I bet they would benefit from these themed coasters. This is one of the first products I bought from you! I was delightfully surprised when they arrived! I compared them to our usual brand and your coasters were far better! Not only in price, but in quality,& quantity. Let's not forget about the gold design! 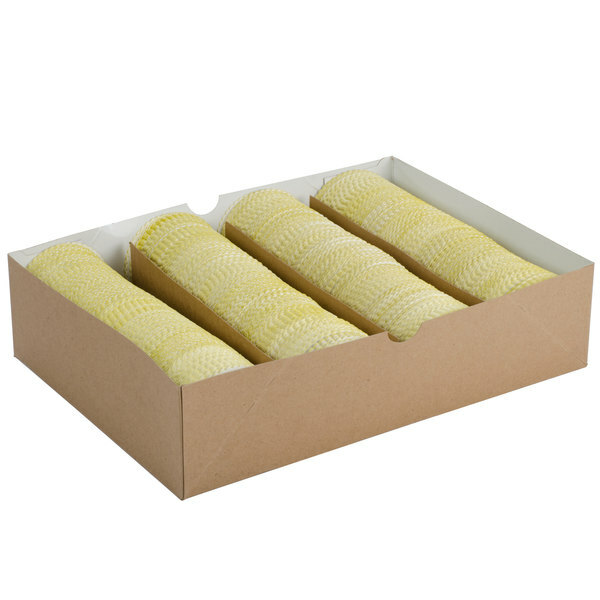 They look nice and are inexpensive.